While there's no shortage of lunch spots in our neighborhood, having meetings around noon outside our lunch zone is a real treat. Today is no exception. Had been wanting to try the lunch at Zampa after having had wine and nibbles a while back. OMG that looks amazing, but I can't recognize it in the menu. What is it? same here...i have no idea what that is but i want to eat it! It was the special of the day. 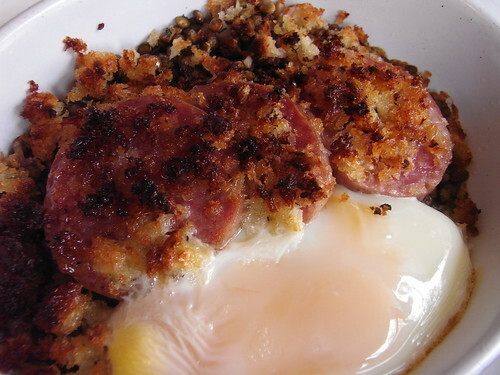 Sausage on a bed of lentils with an egg and baked with scrumptious bread crumbs. It's really far from work though. I don't think I've ever gone further than 6 blocks for food.